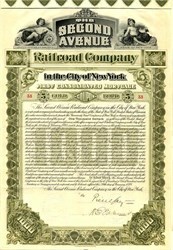 Beautifully engraved uncancelled $1000 Gold Bond Certificate #33 from the Second Avenue Railroad Company issued in 1898. This historic document was printed by International Banknote Company and has an ornate border around it with a vignette of the company's logo between two children. This item has the signatures of the Company's President, Pierre Jay and Secretary, Henry E. Doremus and is over 120 years old. 79 unused coupons attached on top. SECOND AVENUE RR.-Main line, 8 m.; branches, 5.5 m.-total, 13.5 tn. ; 2d track, 13.5 ni. ; sidings, 1 m.-total track owned, 28 in. ; leased, 1.09 tn. ; 2d track and sidings, 1.69 m.-total track leased. 3.38 in. ; total operated, 31.38 miles. Gauge, 4 ft. 81 in. Rail (steel), 60 lbs. Chartered Jan. 21. 1853; road opened in 1854. Leased in Jan., 1898, for the term of its corporate existence to the Metropolitan Street Ry. Co. at an annual rental of 8 p. c. on the stock for three years from March 1, 1898, and 9 p. c. thereafter. Motive power has been changed to the underground electric system. Consideration for franchise, i of 1 p. c. of gross receipts. Cars (box, 162; open, 179), 341; horses, 1,641. Operations, year ending June 30, 1897.-Passengers carried (including transfers), 17,455,287. Gross receipts (passenger. $700.023; other, $4,194), $704,217. Expenses and taxes. $(1.8,407. Net earnings, $75,810. Payments: Interest on bonds. $98,000; dividends (31 P. c.). $60,515-total. $158,515. Deficit, $82.705; surplus forward ($34.055, less $1,514 old balance on labor accounts), $33,141; net deficit, $49,564. Financial Statement, June 30, 1897.-Capital stock (shares, $100; auth., $2,500,000), $1,862,000; funded debt (gen. consol. 5 p. c. mtge. bonds, dated Jan. 1. 1885, due Nov. 1, 1909, interest May and Nov.. $1,600,000; debenture 5 p. c, bonds, dated Jan. 12. 1888, due Jan. 1, 1909, Interest Jan. and July, $300,000), $1.900,000; 5 p. c. 5-yr. mtg.'s. on real estate, dated Nov. 1, 1888, interest May and Nov., $60,000; loans, $215,000; interest on bonds due, $13,833; accounts and sundries. 813,705-total, $4,064.598. Contra; Cost of road, etc., $3,870,438; additions and betterments. $5,768; material, $24,324; accounts, $72,675; cash, $41,829; profit and loss, $49,564-total, $4,064.598. Directors.-Waa. C. Whitney, John D. Crimmins, T. F. Ryan, H. H. Hollister, T. J. Regan. G. G. Haven. Jr., D. FL Shea, W. G. Shatter, Pierre Jay, James J. Traynor, J. Sanford Barnes, Jr., Sherman Flint, Henry E. Doremus, New York, N. Y. Officers: Pierre Jay. Pres. ; H. E. Dorerims, Sec. & Tress. ; Thomas A. Delaney. Supt., New York, N. Y. General Office, 1874 Second Ave., New York, N. Y.
Pierre Jay was the first chairman of the Federal Reserve Bank of New York and former Deputy Agent General for Reparation Payments in Berlin, Germany. He graduated from Yale University in 1892, and was a member of Skull and Bones, one of the most well known of the secret societies based at Yale University.